There's a lot to see on a trip to London, and especially on your first trip to the city. Taking a bus is one of the easiest ways to get a good view of London without much hassle or expense; all you have to do is find out which route you want to take and then leave the driving to them while you gawk at the scene. 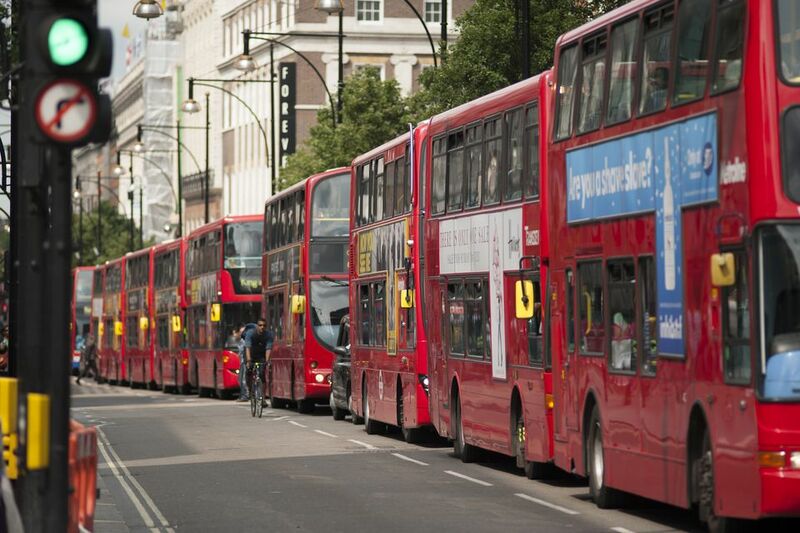 London is covered by more than 700 bus routes, and many travel past some of the city's iconic sights. As a bonus, many of the buses are double-deckers, and what a great view you'll get on the upper deck. This list focuses on routes in central London only and includes links to a full guide that rounds up all the sights included on the route as well as helpful tips and additional information. London buses no longer accept cash fares, so you will need an Oyster card loaded with sufficient credit or a travelcard. You could also consider using a contactless payment card to pay for London transport. If you are short on time and want to guarantee that you see all of the big sights in London, your best bet is the classic Big Bus Tours circular route. This bus route is a perfect one to take if it is your first trip to London. The key section of the No. 11 route starts at Liverpool Street Station and ends at Victoria Station. It goes through the City of London and past such must-sees as St. Paul's Cathedral, Trafalgar Square, the Houses of Parliament, and Westminster Abbey. The best section of the No. 9 route starts in Kensington and ends on the edge of Covent Garden. It goes past Royal Albert Hall and Hyde Park, along Piccadilly, past St. James's Palace and Trafalgar Square. The No. 73 route starts at Victoria Station and ends in Stoke Newington in northeast London. It goes past the Buckingham Palace gardens, Wellington Arch, Hyde Park, Marble Arch, along with the whole length of Oxford Street, and through Islington. The No. 26 route starts at Hackney Wick in east London and ends at Waterloo by the South Bank. It goes through Hackney and the City of London before traveling over Waterloo Bridge for fantastic views on both sides. The No. 24 route starts at Hampstead Heath in north London and winds its way to Pimlico, near ​Tate Britain. It goes through Camden and Trafalgar Square, as well as Parliament Square, where you'll get a glimpse of the Houses of Parliament and Westminster Abbey. The RV1 route starts at Tower Hill, close to the Tower of London, and ends in Covent Garden. The route links the Tower of London to London Bridge and Borough Market, via Tower Bridge, and Waterloo and the South Bank to Covent Garden Piazza. This route starts in West Hampstead and passes through other upmarket North London neighborhoods, including St. John's Wood where the famous Abbey Road pedestrian crossing can be found, before heading along Oxford and Regent streets, through Piccadilly Circus and around Trafalgar Square, and ending in Waterloo with magnificent views from Waterloo Bridge. Visitors to London often walk London Monopoly board locations. It's easier if you take the bus on these four routes, which will drive you past all the Monopoly board locations. These routes all connect. Catch No. 205 at Marylebone Station, No. 78 at Liverpool Street Station, No. 72 at Old Kent Road, and No. 23 at Fleet Street. If you want an abbreviated tour, pick No. 23, where you will hit the jackpot and roll past the lion's share of Monopoly board names on just this one route.